We had almost 30 species on Sunday's 1-hour and 45-minute walk around the Marsh Discovery Trail in DeKorte Park. We are posting it here to give everyone a rough idea of the birds that are being seen at DeKorte these days. Click "Continue reading…" to read the full list. 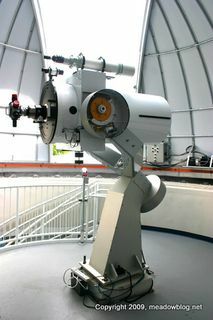 The William D. McDowell Observatory in DeKorte Park begins a new month of programming tonight with free public programs at 8 and 9 p.m.
Each evening two major objects in the night sky will be viewed plus one or two other celestial objects or events depending on the observing conditions.